During late 2018 we welcomed four new full-time staff members at Avington. Three farm residents include overseer Kyle Cordy, formerly a jackaroo at Avington, along with two new Jackaroos Damien Goodman and Emily Webbware, who also joined the team and are settling into work and life on the farm. As overseer, Kyle has a key role in the day-to-day operations of the farm. Reporting to and assisting the Farm Manager, he focuses on livestock health, pastures, property/plant maintenance and development, as well as team performance. Damien and Emily have joined our jackaroo training program as part of our commitment to training young people who want to work on farms and focus on sheep and wool production. Local Nadine Stanton, has been employed in the role of gardener, helping out when needed with stock and general farm duties. Nadiene lives nearby in Baynton with her three girls Matilda (10) and twins Ruby and Maggie, both 8. Merinos have always been a passion that Kyle’s family share. He grew up on the family farm in Harcourt, where the focus was on growing superfine wool. Kyle studied a Bachelor of Agriculture Business Management at Charles Sturt University in Orange. After graduating, he spent two years as a Jackeroo at Avington, and then a further two years before having a year away to gain other experience. Late last year he secured the job of Overseer. 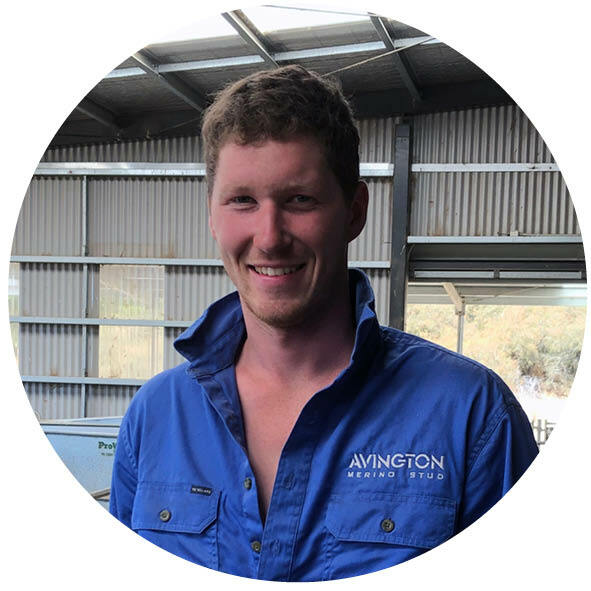 Kyle has a key role in the day-to-day operations of Avington, focusing on livestock health, pasture, property/plant maintenance and development as well as team performance. He lives on the neighbouring property Balboora in his own house. The management team’s continued push for growth as an industry leader in farm management and ethical treatment of their sheep appeals to him, and sees that Noel and Lyndsay show a real passion for the industry as a whole. He enjoys embracing new challenges and seeks out opportunities to grow the business while continuing to help develop best practise quality and procedures. A keen sportsman, Kyle enjoys playing cricket in his spare time. Originally from Traralgon, Damien developed an interest in dairy cattle from an early age, however it wasn’t until he went to the National Merino Challenge in Adelaide at the start of 2018, that he developed an interest in Merino sheep. He found that working with sheep came naturally to him, and he enjoyed learning about wool. Damien studied a Diploma in General Studies at Dookie and later moved onto studying a Bachelor of Agriculture at Melbourne University. The Jackaroo role at Avington caught his attention because he wanted more hands-on experience working with sheep and wool production, along the comfortable accommodation, management team and staff that he would be working with. When he’s not working, Damien actively works on projects at the farm, such as building a dog kennel, always keeping himself busy. In 2018, Emily graduated from Melbourne University with a Bachelor of Agriculture and began looking for somewhere that she could gain more practical experience. She saw the Jackaroo position at Avington advertised and knew that the highly-regarded education program would suit her needs perfectly. Having grown up in Yea on a property specialising in Angus beef cattle and prime lambs, she allready had experience in the meat industry, but was interested in wool production and wanted to discover more about merino farming. Emily knew that the jackaroo program at Avington was well-established, and there was an opportunity for hands-on learning, so she applied for the role and was successful. Emily has many hobbies, including distance running and rogaining (an orienteering sport of long distance cross-country navigation). The Jackaroo role is great for her fitness and keeps her outside where she is happiest. She has joined the local womens’ football team in Kyneton and enjoys the friendly community, along with the great coffee on offer! Nadine grew up in some of the small towns of north-west NSW and has always been interested in sheep and cattle. Her passion in farm work and country life stems from her rural upbringing. On leaving school, Nadine trained in administration and worked in the financial industry, where she eventually became a financial adviser. Having always lived on, or been involved in farms, she developed an interest in gardening. This became an aspect of rural life that she really enjoyed. The gardener role at Avington was advertised in 2018, when Nadine saw the ad she immediately got in touch with Noel and sent in her resume. One thing led to another and before long she found herself in full-time employment at Avington as their gardener. Living off-farm at Baynton, a mere ten minute drive from the farm, also appealed as the role is fairly flexible and accommodates her young family. Due to the changing and seasonal nature of farm life, so too is her role. Her daily routine might involve mowing the verges of the extensive lane way network which runs throughout the property, mulching driveways on a tractor, maintaining the homestead’s established garden, tending to the 14 bed organic vegetable garden grown and nurtured by principal Lyndsay Henderson or hands-on farm work during busy times of the year, such as shearing. The varied nature of the role is what appeals to Nadine because it combines both her passions–farm work and gardening.